During the Historic Shaw Art Fair, Saturday October 4th from 9:30-11:30am stop by the home of Don Christy and Lisa Ellis located at 4169 Flora Place, St. Louis, MO 63110 accessible only through the Art Fair. We also welcome you to invite any friends or neighbors who live in the ward to stop by and meet Kevin. An RSVP is not necessary but appreciated. 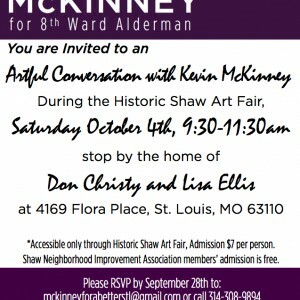 If you plan on stopping by please RSVP by September 28th to: mckinneyforabetterstl@gmail.com or call 314-308-9894. Your RSVP will help us plan for ordering food and beverages. *Accessible only through Historic Shaw Art Fair, Admission $7 per person. Shaw Neighborhood Improvement Association members’ admission to the art fair is free.